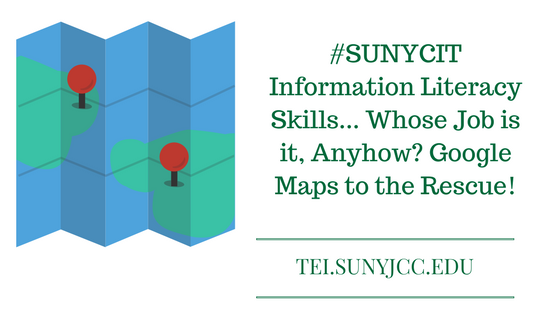 #SUNYCIT: Information Literacy Skills… Whose Job is it, Anyhow? Google Maps to the Rescue! Another informative presentation was given by Kathleen Gradel from SUNY Fredonia. This presentation focused on developing digital literacy using Google Maps. This presentation was similar to the presentation I sat in on at Canisius College. In this presentation, Gradel discussed a group project where students had to create elements for an augmented reality application. As usual, Gradel included a link to her presentation and support information. The course was designed for 1st-year students. One of the student learning objectives focused on digital literacy. The course was blended with 50% in the classroom and 50% digital. The final project was an augmented reality overlay, which displayed information regarding the campus. The information would be displayed in an application called Wikitude. Students were divided into teams of four. Each group focused on a specific theme for the project such as health and wellness, athletics, academics, etc. Using a Google Sheet, teams collected information for their area such as latitude and longitude, titles, descriptions, etc. Each point had to be unique, therefore, teams had to deconflict points. Each point went through a peer review using the Pixar model. All the writing and editing was completed in the first week. Once the edits were complete, the team geeks prepared the KML file. After testing the points on Google Maps, the KML file was uploaded to the Wikitude program. The teams once again test the points using the Wikitude program. This seems to be a great project resulting in a real artifact that can be used and shared well after the course is complete. Students will have to learn to write for an audience, work as a team, and work with varying technologies. Some of these technologies include GPS devices, Google Maps, KML files, Google Sheets, and Wikitude. It is a project I plan to use for my student success seminar. If you have questions about this presentation, please contact me. #CANISIUSCIC: Augmented Reality + Google Maps: Integrating Skills with Zest!